For many decades Tung oil has been the preferred finish for everything from fine woodwork and furniture to marine applications on boat decks. Until the discovery of alkyd resins, Tung oil was a key component of paints and caulk and many manufactures of quality varnishes still use it today. Many woodworkers consider this to be the best natural finish for wood. This finishing oil originates from the seeds of a tree from China. Tung Oil is considered a drying oil like other natural plant oils; linseed, poppy seed, safflower seed and soybean. Unlike other plant oils, such as linseed oil, this natural plant oil has the ability to dry quickly, typically taking 24 hours. As drying progresses it transforms itself into a tough waterproof coating. Typically takes 4-6 coats before it becomes fully resistant to water. Typically this type of natural finishing oil is used on unfinished interior wood surfaces. These can include doors, trim, cabinets, paneling and furniture. Can be used on food contact surfaces as well. Including butcher-block counter tops and cutting boards. Because of its non-toxic nature it can also be applied to children’s toys. Patina – Develops a depth and tone of color as it ages. This isn’t possible with modern synthetic finishes. Does not darken with time. Unlike Linseed oil which becomes very dark as it ages. Easy to Apply – Smooth surfaces, such as furniture or doors, can be hand rubbed or brushed with a natural bristle brush. This is a great finish for many interior wood surfaces. Can be used on exterior wood surfaces. Adds vital oils and moisture to dry wood. The applied finish can be easily renewed with the addition of another coat. All natural “Green” wood finish. Can be used on food contact surfaces. Pure oil will take extra time to dry, 48 hours or more, before buffing or recoating can be done. Polymerized oil is basically the same as pure but has gone through a heating process. This type will dry faster, 24 hours, and will still produce a hard, flexible coating that is water proof and resistant to many chemicals. Most modern Tung oil finishes are not pure oil, but a mixture of oil, resins and solvents. These additional ingredients can help with drying, hardness, penetration and flow. There are many manufactures of natural plant oil products and they all have different formulations. Pure tung oil can be expensive; with additional ingredients (fillers) the price has become cheaper. 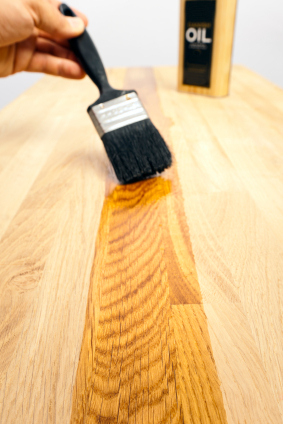 Applying this finishing oil is easy and maintenance is as simple as applying another coat. 3-4 coats will result in a matte finish that will not darken over time. If more sheen is desired you will need to buff and wax the finish or use a formulated product.